Smooth, flicker-free dimming for constant current LED lamps or strips, from maximum current set to 0.0001%. Can be positioned over 100m from the LED light source(s), allowing remote placement in electrical distribution cupboards or other convenient locations. Ten different maximum current settings on multi-position switch. Can be supplied with the current factory-set to customer requirement. DIN rail mounted dimming driver for constant current LEDs. Smooth, flicker-free dimming from maximum current set to 0.0001%. Multi load’s proprietary Constant Current Reduction (CCR) technology keeps RFI along cabling to a minimum (current is not constantly switched on/off as in PWM dimming). Can be positioned over 100m from the LED light source(s), allowing placement in electrical distribution cupboards or other convenient locations. This eliminates the need for drivers to be placed in the ceiling, making maintenance easier, eliminating ceiling clutter and allowing DC voltages to be used in installation –greatly reducing electrical noise. DALI and DMX interfaces available. Hot pluggable – allowing LEDs to be replaced without switching off power to the LDR100. On-board monitoring of current settings over time, allowing warranties to be honoured. Ten different maximum currents on multi-position switch. Selectable between 500mA and 1400mA. Can be supplied with current factory-set to customer requirement between 100mA and 1400mA. Forward voltage: 3V – 45V. Short circuit protected and hot pluggable. Dimming control 0/1-10V signal. DALI and DMX interfaces available. Supply input voltage 15V DC. Class 2 product, SELV compatible, requires power supply to applicable national standard. Efficiency greater than 90% at maximum load. DIN-rail mounted unit supplied with wall-mounting brackets. Power supply with 15V DC output. 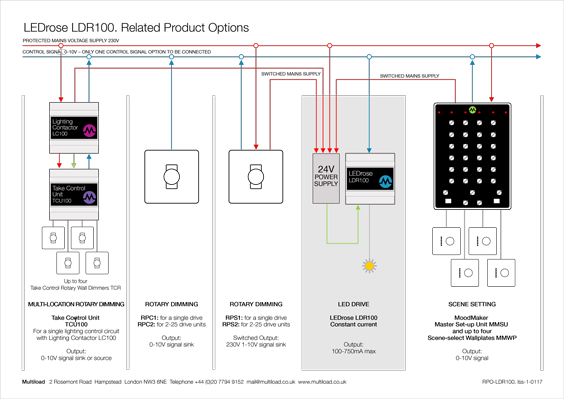 0-10V rotary dimming and mains switching. 0-10V rotary dimming and switching using only 2-core cable. When the RPC series is wired to one or more LDR100, the lighting circuit can be dimmed to zero light output. If mains switching is required use LC series of Lighting Contactors (for additional information on LC series see here). 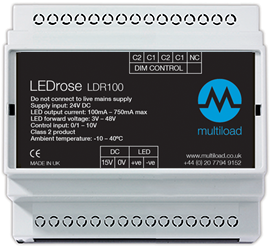 Enables LDR100s to be switched and dimmed from up to four wall plate locations around a room or building to zero light output, with each Take Control Rotary (TCR) seamlessly taking control of both dimming and switching. LDR100 can be used with any third-party lighting control system that provides 0/1-10V control signals. DALI and DMX interfaces available.